The following figure shows how to solve two-step inequalities. Scroll down the page for more examples and solutions. The rules for solving inequalities are similar to those for solving linear equations. However, there is one exception when multiplying or dividing by a negative number. • Add the same number to both sides. • Subtract the same number from both sides. • Multiply both sides by the same positive number. • Divide both sides by the same positive number. • Multiply both sides by the same negative number and reverse the sign. • Divide both sides by the same negative number and reverse the sign. If an equation has like terms, we simplify the equation and then solve it. We do the same when solving inequalities with like terms. The solutions to linear inequalities can be expressed several ways: using inequalities, using a graph, or using interval notation. 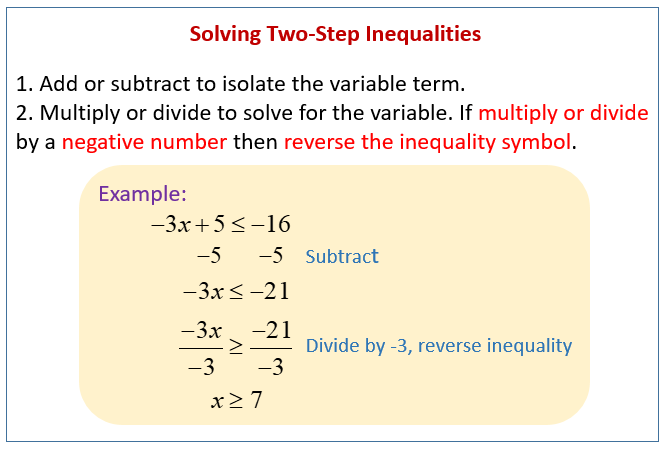 The steps to solve linear inequalities are the same as linear equations, except if you multiply or divide by a negative when solving for the variable, you must reverse the inequality symbol. Solve. Express the solution as an inequality, graph and interval notation. Main rule to remember: If you multiply or divide by a negative number, the inequality flips direction. Students learn that when solving an inequality, such as -3x is less than 12, the goal is the same as when solving an equation: to get the variable by itself on one side. Note that when multiplying or dividing both sides of an inequality by a negative number, the direction of the inequality sign must be switched. For example, to solve -3x is less than 12, divide both sides by -3, to get x is greater than -4. And when graphing an inequality on a number line, less than or greater than means an open dot, and less than or equal to or greater than or equal to means a closed dot.